Just like you want your salespeople to have a continual prospect list that they frequently work with, it is just as important that you as a Manager always have a certain number of A, AA, and AAA Potential Top Producers in your A Gain Column (Prospect List). That way you are not caught short when someone leaves. 90% Preparation 10% Perspiration. Put these potential top producers on a data base and begin to build a relationship. In the beginning they don’t need to know they are on your list. That way you can change your mind without hurting the relationship. You can hire and dismiss them without them even knowing they were hired or dismissed. I have done this many times! This would be someone who has never worked with us. Most probably there is little or no relationship with this potential top producer and we have to move the potential employee into the “Attraction” Stage and on into the “Exploration” Stage and possibly into the “Development” Stage of the relationship. Because of the business potential this person could bring we recognise that it is worth a significant effort to try and gain them as a team member. 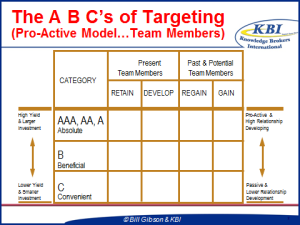 Therefore the potential team member goes on our Gain potential team member list. 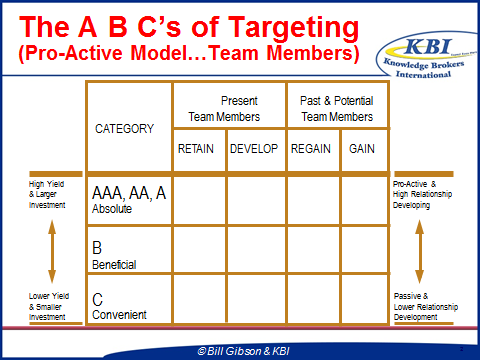 Know what an “AAA, AA, A” Salesperson or other key person would look like. 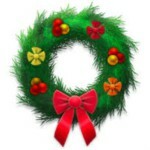 Can deal with top executives and professionals. Let your network know the kind of person you are looking for. Have your network introduce you or give you good referrals. They won’t normally introduce or send you to anyone that isn’t credible. Once you know what your Ideal salesperson or key person looks like identify the type of associations, organizations, events and establishments these people would frequent. Launch a “Be Seen” program so that you meet these people. 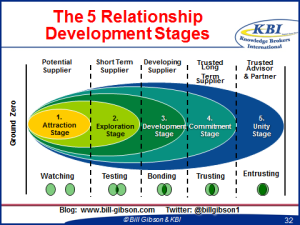 With these potential Salespeople/Key Persons you will usually be at the Attraction, Exploration and Development Stage so it will require frequency of contact and value adding time to develop the relationship. Have a system of follow-up and pre-planned things you can do to add genuine help and assistance in their life. Your best network contacts are clients and associates you are at the Commitment and Unity Stage with. Draw on these people for introductions and referrals. They can help accelerate the relationship development because of their credibility with the potential employee they refer you to. Be sure to keep your network contact in the loop as to the results you’ve had with the person they referred you to and always thank them. To Gain business you need to continually prospect. The potential salesperson etc. pipeline must be kept full. Decide the number of potential salespeople or key persons you want to continually have on your GAIN list that you are continually contacting and building the relationship with. Know and show your own uniqueness and that of your organization and its products and services. At the Attraction and Exploration stage you need to display some uniqueness, special expertise and a different and valuable way of doing things to convince the person to want to consider joining you. In one situation in South Africa one of my clients invited a potential executive to fly from Durban to Johannesburg and join them at a function with potential clients. It was the second function in a month. By that time he was already feeling part of the team. This is the end of my four articles on How To Regain, Develop, Regain and Gain Top Performers In Your Organization. I trust you have received tips and reminders you can use. Please feel free to contact me if I can be of assistance to you or your organization. Also feel free to share this article with your associates, clients and on social media. For a copy of Bill’s article on How To Hire The Right People please contact us bill@kbitraining.com. Also consider letting RAW IT help you find the right people. 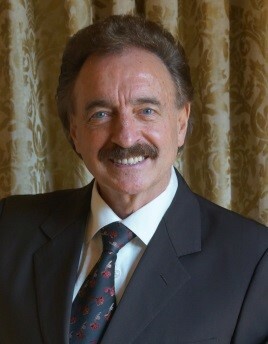 Bill regularly runs public seminars and workshops on the topic of Boosting Sales And Profits In Any Economy. He also conducts In-House Training Programs and is a popular Keynote Speaker. Companies can also obtain a license to have their own management and trainers conduct In-House Training with Bill’s programs and systems. To help you get to know Bill better, we have included a 52 minute podcast link with Bill on Timothy Maurice Webster’s UnBranded show on Cliffcentral.com that was recorded on the 26th of January 2016. http://cliffcentral.com/unbranded/unbranded-powerful-personal-brand/. You may want to play this at a sales meeting or a staff meeting and have a discussion with your team about what was of value and ideas that could be implemented. When we lose a good client do we just let them go and never try and regain them? No…or at least it should be “no.” In business it is important to try and regain lost clients. The same principles should apply when we lose good productive people or top performing salespeople and marketers. 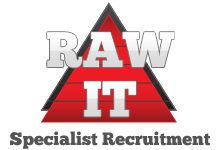 This article is number 3 of a series of 4 articles I am writing for RAW IT, one of the greatest clients I have worked with. 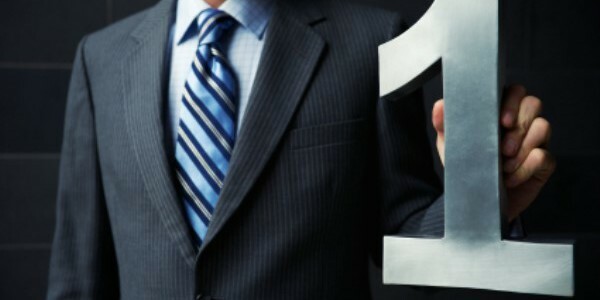 It is on How To Regain Top Performers Back Into Your Organization. This person will have written a large amount of business in the past or was a great producer in a department in the past and has left our company. It could be a past or lost relationship with this person who we see as still valuable. We have to possibly start at, or below, ground zero and move this past employee into the “Attraction” Stage and then on into the other Stages. Because of the amount of potential business this person could write or their high level of productivity they are capable of we recognise that it is worth a significant effort to try to Regain this person back into our company or team. A good Regain Strategy starts the moment someone decides to resign. Treat them well, be understanding and wish them well. Tell them how valuable they have been and that they are not replaceable. Go overboard with a farewell party and gifts. Also give the person a great reference letter…if they deserve it. This kind of treatment does not “burn bridges.” The grass always looks greener on the other side of the fence although it usually is not. Put the person on your data base. Keep in contact on a regular basis and keep them in the loop as to what’s going on. Assist the person where you can. Tell them they are missed by everyone, and that they were of great value. 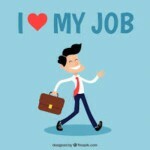 Most people that resign and go elsewhere are usually too proud to admit they are not happy with the new position. Let them know that you and the team would welcome them back at any time and ask them not to be too proud about coming back if they want to. I regained a good person a year and a half later after he left. I was very happy to have him back and 4 years later he is still with me. Most people leave for a reason. If you’ve made positive changes that they would appreciate then let them know about the changes. Continue to include them in VIP Functions and as part of the VIP Treatment that you give important clients and associations especially if you really would like them back. If an apology is necessary … apologize. Good people often leave because their feelings were hurt or they were not handled properly. Apologize if it is appropriate. You’ll be a “bigger person” because of it. I think you can see the importance of the regain strategies, tactics and actions. Make a list of your past team members who have left and make a plan to regain some of these people. It is never too late! Please feel free to share this article with your associates, clients and on social media. 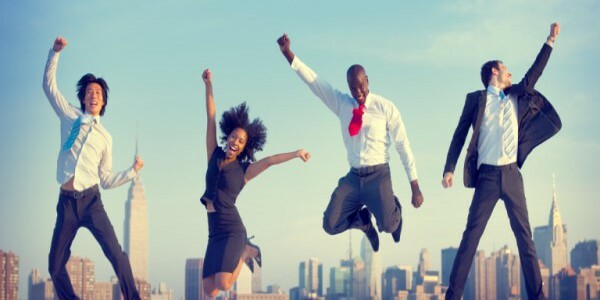 Contact us for a copy of Bill’s article on How To Boost Morale & Performance With Your People bill@kbitraining.com. 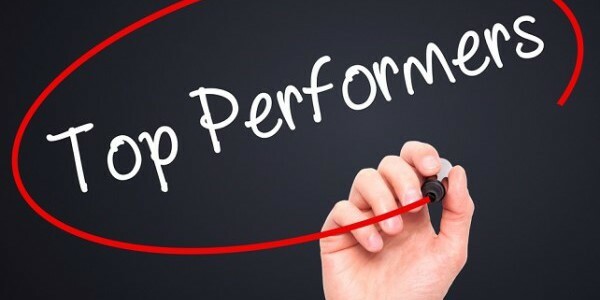 The previous article was on the topic “How To Retain Top Performers In Your Organization.” This article is focused on the Develop strategies, tactics and actions that will help you develop top performers in your organization. We are possibly receiving a small share of the potential business they could be writing or handling and there is lots of room for growth. Relationships with this staff member would most likely be at the “Exploration” and “Development” Stage. We need to dedicate a high level of energy and focus to help develop and grow the amount of business they could write or the amount of work they could handle efficiently. This often applies to salespeople and key personnel that are new and you need to develop them or at least develop the relationship. You may also have people that have been with you for quite some time and you haven’t developed the relationship as far as you’d like. Following are a few suggestions on the Develop strategies, tactics and actions. Take the time to get to know their aspirations, goals, likes, dislikes and motivations. That way you can help fulfil some of those for them. In other words do a personal needs analysis on them just like you would with an important Develop Client. Contact me at bill@kbitraining.com or phone +27-11-784-1720 and I will send you a sample. Someone you want to develop needs a career path. Sit with them and design one. They will feel part of the long term plan and the relationship will grow and the person will feel more inspired. In other words, do a personal needs analysis on them just like you would with an important Develop Client. To grow them and make them feel good about themselves you could add-on and increase their responsibilities at a speed they can handle. Responsibility is one of the 5 main motivators according to Herzberg along with Recognition, Advancement, Achievement and the Work Itself. Set up a Frequency of Contact plan and have regular one-to-one time with the person. There are the three types of time we all physiologically need. They are One to One Time, Group Time and Alone Time. As a manager it is important to give each of your people one to one time with you on a regular basis. The next article I will write for RAW IT will be strategies, tactics and actions on How To Regain Top Performers In Your Organization. Within my sales and marketing materials we put a lot of time and effort into the classifying of clients and implementing strategies, tactics and actions to Retain, Develop, Regain and Gain Top Clients. Similar strategies, tactics and actions apply to retaining, developing, regaining and gaining top performing salespeople and marketers in your organization and in your teams. I will be writing four separate articles on this topic for one of my favourite clients RAW IT over the next few weeks. This first article is focused on the strategies, tactics and actions on “How to Retain Top Performers in Your Organization.” It will be leaned towards sales although the principles apply to top performing team members in any department. The relationship with this top performer would most likely be at the “Commitment” and/or “Unity” Stage. We should be dedicating sufficient energy to retaining this relationship and keeping this relationship and this person performing at his/her high level of achievement. We should also be looking for opportunities to help this person increase the amount of business he or she writes as well as minimising the opportunity for a competitor to recruit them away from us. As management, we often devote most of our time to try and get our non-producers performing and forget about our AAA, AA and A category Top Producing people. With these people be “pro-active” in solving problems for them and providing support in areas they would rather not handle or don’t have the time to handle. Some companies provide part-time assistants that really help them be even more productive. Once I convinced a radio station owner to pay part of the wages for me to have an assistant to deal with administration and research. As a top performing media salesperson I almost tripled my sales in 2 months. If you’ve got a AAA, AA, A Performing Retain Team Member or other key performing person he/she should receive special treatment and incentives for their loyalty just like we do for clients. It could include days off, certain expenses paid, giving them referrals, memberships to clubs etc. Treat them like you would a top client because they are important to you. Make sure you have a frequency of contact plan. Put in time with them, give them real assistance. Become a close associate and respond immediately in a time of need. Many staff members have made up their minds to devote their working lives to a company or leader because of the leader’s caring response during a tough personal situation. Be sure you have all the pertinent personal information on this person. E.g. 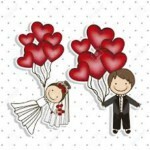 Spouses name and employment, names & ages of children, hobbies, sports, interests, spiritual and religious directions and a host of other things. The more you know about them, the easier it is to add value. Set up a process of follow-up with this very important person. Have a record of birthdays, anniversaries, important events and plan your frequency of contact program just like you would with a AAA Client. Just like with AAA Clients you need to closely monitor the relationship so that you can quickly spot any issues that could deteriorate the relationship. Be aware of the things that can put the relationship at risk and be prepared to put a plan together to change or correct the situation. To replace top people is very expensive and it could take months and years to fill their shoes if ever. A good retention program is key. I trust these quick tips have been of value to you. 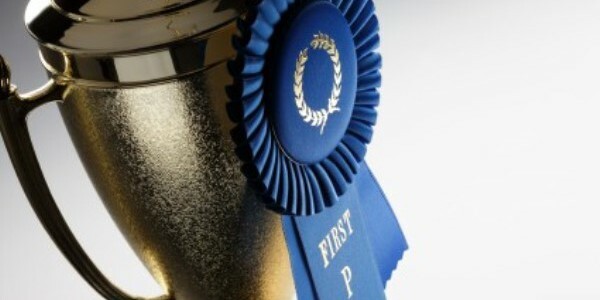 Our next article will be on How To Develop Top Performers In Your Organization. For a copy of Bill’s article Bust Your Sales Targets In Turbulent Times contact us bill@kbitraining.com.